I'd like to thank the Academy. The Garmin Forerunner 620. The Fitbit Charge HR. 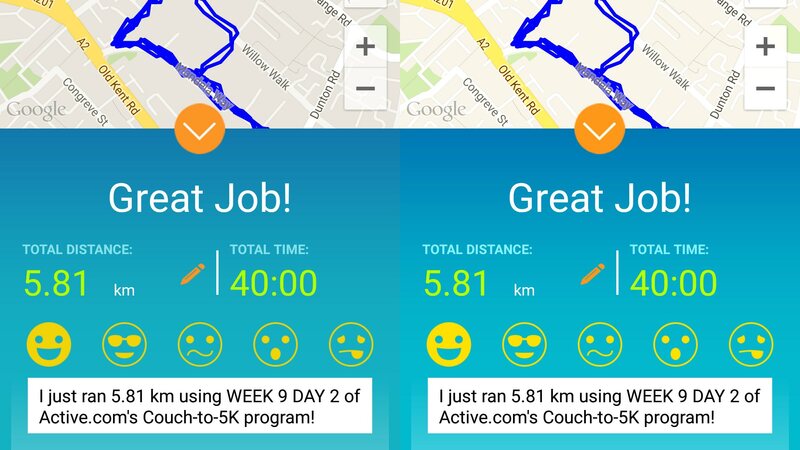 The Active.com Couch to 5K app. The Jabra Sport Pulse. The Wahoo Tickr X. MyFitnessPal. The Jawbone UP Move. Too many wearables and fitness apps to mention, really. I'd also like to thank the girl in the faded pink hoody and jogging bottoms who lapped me on my last run. And the friends who have messaged to tell me about going out on their first attempts after seeing my work. It means the world to me. This one's for you. My internet is down, my stress levels are up but it's now or never. I'm just going to do it. I'm going to run 5K. Now. It's two days before I need to head to Barcelona to report on the wearable tech at Mobile World Congress and though I've toyed with the idea of completing this challenge's final run in the Spanish sunshine, there's simply too many variables - my schedule, my energy levels, my running route. Best to get it over and done with. Well I will once I charge my Moto X and my Sport Pulse, the Forerunner 620 is ready to go and just for good (heart rate) measure, I decide to keep the Charge HR on too. I get changed and add a couple of victory tracks to my running playlist for the 5 minute walk at the end of my run. The anticipation is killing me. And some friends are due to come round in an hour, expecting fajitas, I better get a move on. I'm out. I've left my keys inside as my flatmate is in, it's just me, my gadgets and my music. Five minute warm up walk to start and I'm bounding around the small park opposite my building, after stretching my pesky calves out on the kerb. I'm technically on Week 9 Run 2, not 3, but having already ran for 30 minutes straight once before, I'm pretty sure I'm ready. Of course, the headline distance on the Couch to 5K app includes the walking so I need to make sure I actually run 5K - that's why I don't start the Forerunner until the warmup is over. And now I'm running. The sun is going down on a lovely London afternoon, the air is cool … and I'm immediately regretting wearing both a running watch and a fitness band. I'm having to work to get my time down and suddenly I feel shackled on both wrists, should have left the Fitbit at home. As usual, the first ten minutes are the hardest, I'm distracted, I keep glancing at my pace and worrying or skipping tracks from Gil Scott Heron to Beyonce to Todd Terje. And then, somewhere around the 15 minute mark, I get pins and needles in my right foot, I quickly stop to slip it out of my too-tight Mizuno shoe and bash it against a lamppost, glance at the Garmin, I'm actually doing fine. A girl who had been running ahead of me suddenly runs past my left shoulder - I've been lapped, but that doesn't matter. I'm off again. And my go-to (eight minute) track F*ck Buttons' Flight of the Feathered Serpent has just come on. I'm running faster now, faster than I have this whole past two months, my breathing is regular, there's no pedestrians or traffic lights in my way and I can see the bright lights of London Bridge and the Shard in the distance. Maybe it's the endorphins kicking in early but this is really fun. I'm almost completely focusing on what my legs and my arms are doing now. But a small, giddy section of my brain is looking forward to the achievement - small as it is - of completing this 5K challenge. In fact when I near the end of the 30 minutes, I don't really want to stop. But as the Garmin beeps for the fifth time and the Couch to 5K app lady says 'good job' in my ear, my playlist clicks over to the opening bars of the Diana Ross Edit version of 'Ain't No Mountain High Enough' and I slow into a walk. This is my sweatiest run yet and my heart rate was up in the 160s for a decent chunk of it but there's a big smile on my face as I let my hair down out of its messy bun and saunter home. The fajitas will be late but I don't care. Get the Fitbit Charge HR if you're a total beginner and it's about overall fitness, not just running. The Garmin if you're going further than 5K or care about your pace - i.e. if you're ultimately entering a 10K for charity or beyond. The Jabra Sport Pulse if you want fuss free, wireless earphones that track heart rate but you can live with them being up to 5bpm out. The Jawbone UP Move if you're on a budget. Don't get the Microsoft Band. Just don't. Please stick with one wearable or at least one app ecosystem. Do not under any circumstances do what I did and try out multiples devices, apps and communities over the weeks. You need to see your progress, that's what will spur you on. The Couch to 5K app I was using supplied this but I would have stuck to the routine, and probably ended up running faster, if all my runs and daily fitness and food activity were neatly saved in one place. This whole thing is easier if you have an iPhone. With the exception of Android Wear, there's more choice in terms of wearable kit for a start. And beginners looking to get fit, get running or get healthy can get more out of Apple Health right now than Google Fit. I have an Android phone so that's no use to me. Tell your friends. As in get them to be running buddies with you but also tell them an hour before you're planning to go out for a run, especially the final 5K. Then if you don't go, you have the shame of lying to them - note, you will never admit that you didn't make it out for a run. Don't eat cheese or biscuits before you run. Try a banana instead. Don't feel silly that you haven't run 5K yet when your friend is training for the Paris marathon. It's your challenge, not theirs. And you're both runners now. You're in the club. If your calves, apparently one of the body's weakest muscles, ache - as mine did - have a warm shower then turn the water cold at the end and give them a blast. Keep your wearables charged. There's nothing more annoying than having to go back to your old earphones because your wireless, heart rate monitoring pair are still charging. That goes for your phone, too, if you take it out running. No excuses. If you miss a session, just carry on. Finding the time to run three times a week is tricky and I managed to complete the challenge without quite making up the total of 27 runs. You'll know if suddenly a week feels way too difficult - hey, you can always do it in ten weeks instead of nine. Learn when you enjoy running - for me, it's early evening as it's going dark. Yes, I'm told I should head out first thing but if I'd tried to build this into a routine, I know I would have failed. Early evening works for me. Figure out what works with what - MyFitnessPal links to Garmin, for instance. Some trackers from Fitbit and Withings can easily hook up compatible smart scales. Get moving, everyday - that's what a fitness tracker can help with. If you do, you'll get to the stage where you miss the walk or gym workout or run and want to get off that ol' couch. No begrudgingly about it. You will get fitter, it might not feel like it if you're struggling on say, Weeks 2 and 3, but the just get out there three times a week and the fitness will come. Seriously, worry about pace later. You can do it.